As we get ready to close out 2016, it's a pretty safe bet that telehealth is going to be an even bigger headline grab in 2017 than it has been this year. Let's take a look at why. Earlier this month, the House of Representatives passed a bill called the 21st Century Cures Act. The bill — which is awaiting Senate approval — is actually intended to make the FDA drug review process more efficient, but it also includes parts dedicated to the use of telehealth services. The telehealth provisions of the bill require the Centers for Medicare and Medicaid Services (CMS) to provide a report on the population of Medicare beneficiaries "whose care may be improved most in terms of quality and efficiency by the expansion ... of telehealth services," the bill reads in part. The CMS report also must include information on any ongoing telehealth demonstration projects, the types of services that might be suitable for the use of telehealth and an explanation of barriers that are currently being faced regarding telehealth under current Medicare laws, according to NAHC. In regard to patient care, a recent report has found that veterans who are dealing with depression can be treated just as well with telehealth as with in-person care. The study examined more than 200 senior-aged veterans for once a year between 2007 and 2011. 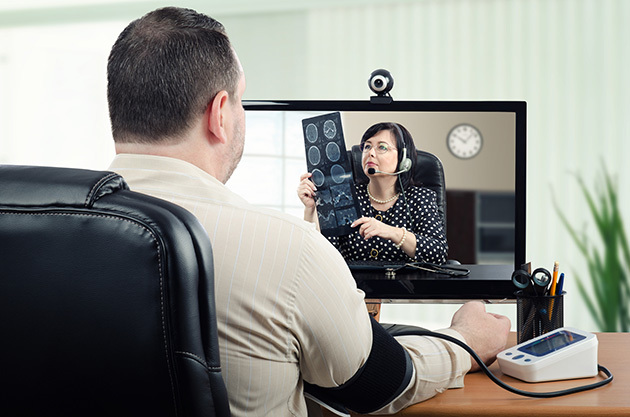 The researchers from the Medical University of South Carolina and other institutions found "little or no meaningful difference" in symptoms or patient satisfaction between care delivered in a clinician's office and that delivered via video. Leonard Egede, M.D., director of the MUSC Center for Health Disparities Research, a VA physician and the lead author of the study, said the study shows telemedicine is a relevant option to address the needs of rural patients or those living in remote locations. Egede studied 241 veterans across the course of a year, randomly assigning some of them to eight weeks of in-person counseling and others to counseling via phone and video monitor. The study focused on the elderly population, who have limitations in terms of mobility and transportation options that make them good candidates for depression therapy using telemedicine. Finally, looking at the industry landscape, the worldwide market of telehealth is on track to reach 27.5 percent CAGR through the year 2021. This growth is driven by an increase in geriatric population, the rising prevalence of chronic diseases and a dearth of healthcare professionals worldwide. North America is expected to account for the largest share of the global market, a new report suggests. The telehealth market is projected to reach $9.35 billion by 2021 from $2.78 billion in 2016. Regulation, patient use cases and projected growth rate seem to suggest that it's going to be a busy and exciting year for telehealth in 2017.